Lieutenant Robert McKenzie, No. 2 Squadron Australian Flying Corps. When the First World War began in August 1914, aeroplanes were a novelty, barely a decade old. Despite this, Australia was one of just a few nations outside Europe to establish a military flying school and corps. From a first class of four student pilots the Australian Flying Corps would grow to number almost 4000 by the armistice. Its young volunteers were pioneers in a completely new dimension of warfare as they struggled for control of the skies over the Western Front and Middle East. Using private letters, diaries and official records, historian Michael Molkentin reveals, for the first time in over 90 years, the remarkable story of the airmen and mechanics of the Australian Flying Corps. It is a tale of heroism and endurance; of a war fought thousands of feet above the trenches in aircraft of timber and fabric. 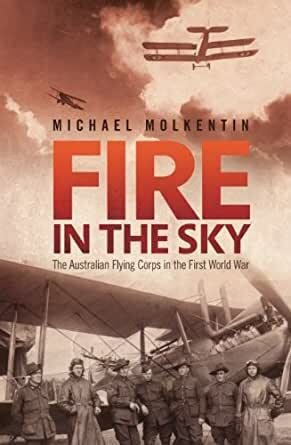 Fire in the Sky takes readers up into this chaotic tumult and into the midst of a war from which only one in two Australian airmen emerged unscathed. "Although academically sound this book is an exciting read . . . the author brings the war to life by skilfully weaving in a large number of quotes from the men who fought with the Australian Flying Corps (AFC). . . . an excellent book, well written, decent maps and excellent illustrations. I cannot recommend it too highly." --Peter Hart, author, "The Somme: Darkest Hour on the Western Front"
Seems to be a very comprehensive history of Australian flying in WWI. Fascinating read to a flying enthusiast, but also interesting from a historic perspective. Great and revealing read. Highly recommended. Australia was the only Commonwealth nation (aside from Great Britain) to field an air arm in the Great War. Four front line and four training squadrons went overseas from 1914. This book provides a fantastic record of their activities. But it isn't a dry old history lecture - it is full of tales from the men who flew fragile biplanes over inhospitable desert, the muddy trenches, and fought the enemy in true ANZAC spirit. A lot of names which became Australian household names in the 20's and 30's began their story here - Hudson Fysh, Kingsford Smith, and Harry Cobby to name a few. The unsung are not forgotten either - the families at home, the ground crews, the locals - all are included. An excellent read - I commend it to anyone with an interest in Australian war history, and anyone with an interest in the early days of flying. I only gave it 5 stars because Amazon doesn't have 10! This is a wonderfully balanced overview of the Australian Flying Corps in World War One. The author uses memoirs from survivors and official accounts to paint a comprehensive picture of the personal costs of fighting the first war in the air. He pulls no punches. The strain is made clear and the psychological cost becomes obvious. The author also provides context with accounts from non-Aussie witnesses to highlight the universal experience of aviators from all sides. An excellent update to the official history. How it all began at Point Cook, pretend aeroplanes, then of we go to war. The Sinai desert in support of the light horse, wobbling into the air the fledgling airforce takes shape in one of the most important theatres of the war. You meet all the famous pioneers of Australia's comercial airlines cutting their teeth in the sandstorms of Arabia. Michael Molkentin has crafted a wonderful story of the birth of the RAAF and the wonderful charachters involved, its all been done before but this is the best one yet. This book is very informative and entertaining. The writer has a gift for giving both the overall stategic and tactical importance of missions and campaigns, and the intimate and revealing lives of individual pilots. This book tells the story of the Australian Flying Corps in the First World War. Which makes it a novelty to start with as it is a subject not heavily covered. Australia was in the process of creating some form of aerial corps just as the war clouds started to form over Europe and so was uniquely placed amongst the various British 'dominions' in that it fielded right from the start it's own aerial forces, as slim as they were at the very start. This book gives a very effective thumbnail sketch of the state of military aviation in the years before the war and then gets right into telling the chronological history of the AFC in WW1. Initial operations were in the Middle East and so the author tells the story of operations there all the way to the armistice with Turkey. It's quite interesting because when most Australians thing of the campaign against Turkey they think of Gallipoli and perhaps the Light Horse. So to hear stories of Australian units and their contribution to that theatre is interesting. The author then looks at the European theatre where Australian units were on the scene later in the war than their commencement of operations in the near east. This theatre was obviously a real meat grinder. The author eschews the notion of portraying the men involved as heroes without flaw, he talks about the nervous breakdowns and the problem drinking and the very high casualty rates are openly discussed, as is the very brief mourning period for anyone lost. What hits the modern reader between the eyes over and over again is the mechanical issues of flight and the level of overall technology available at the time. The communications issues, the way things were done and the changing tactics as the aircraft became better and better are all very interesting for those used to 24 hour connectivity. There are a range of end notes, a bibliography and some useful pictures scattered throughout the book. The author is to be commended for writing a viable history but doing so in a fashion informal enough to not scare away the casual reader. He has also - thankfully - avoided the pitfalls inherent in much Australian literature of jingoistic silliness and taking relentless cheap shots at the British. A worthwhile read for anyone interested in the early days of military aviation.